How Much Water Do Apple Data Centers Use? Apple will fund construction of a wastewater treatment facility in Prineville, Oregon, where its data center campus is the single biggest consumer of water, Oregon Live reported. Data centers use enormous amounts of water to cool IT equipment they house, and reducing water use by data center cooling systems has been growing in importance. Numerous data center operators have been designing their cooling systems in a way that enables them to use recycled municipal water. The issue of data center water usage gained more attention last year as a result of the drought in California, which is continuing despite a relatively wet winter season. In its most recent Environmental Responsibility Report, Apple provided some details on water use by the data centers it owns and the company’s efforts to reduce it. The report doesn’t provide the full picture, since the company leases space from data center providers in addition to the facilities it owns and operates. The four data center sites Apple owns, however, support “the vast majority” of its online services: Maiden, North Carolina; Newark, California; Reno, Nevada; and Prineville. In fiscal year 2013, Apple data centers for the first time consumed more energy than each of the two other major elements of the company’s operations: corporate offices and retail stores. 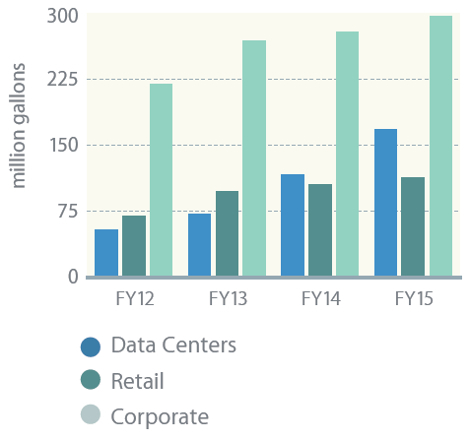 The following year, data centers outstripped retail in terms of water consumption. Apple’s corporate offices have always consumed more water than either of the two other categories (a lot more), but water consumption by the company’s data centers has been growing much faster than corporate, due to the amount of data center expansion Apple – like other internet and cloud services giants – has been doing in recent years. Together, Apple stores, data centers, and corporate offices used 573 million gallons of water in fiscal 2015. Its data centers consumed about 160 million gallons. As it expands employee headcount in its offices and capacity of its data center infrastructure, Apple says it makes efforts to reduce the impact its operations have on local water supplies in its numerous locations. In data centers, those efforts have until now come down to innovative cooling-system design, focused on reusing water and maximizing the use of outside air instead of chilled water. One example is Apple’s biggest data center campus, in Maiden, which has a cooling system that recirculates water 35 times, reducing its water consumption by 20 percent, according to Apple. Building the wastewater treatment plant in Prineville is a first for the company. The nearly 340,000-square foot Apple data center complex in Prineville consumed 27 million gallons of water in 2015, Oregon Live reported, citing estimates made by the city. That number was higher than day-to-day data center operations would require because of construction the company is doing on the site. Because the magnitude of the impact of water use varies greatly from location to location, the company analyzes water consumption by each of its facilities in the context of the location it’s in and the nature of the local water supply.